← check out this video of the show!! On Wednesday evening, March 7, three Chautauqua County artists will be featured during the second of three Salons presented in conjunction with the Women Create art exhibit. The Salons are held in the 3rd on 3rd Gallery, 116 East Third Street, next to the Reg Lenna Civic Center in downtown Jamestown, where the exhibit runs through March 31. 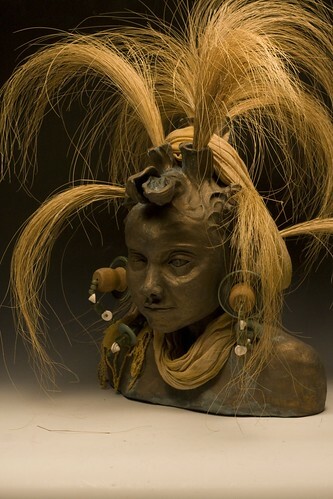 Shown here is the terracotta and mixed media “Corn Goddess” by Bethany Bjork, one of the presenters. Jamestown, NY – Three Chautauqua County artists will be featured in the second Salon presented in conjunction with the Women Create art exhibit at the 3rd on 3rd Gallery. The Salon will take place from 7-9 pm on Wednesday, March 7 in the Gallery at 116 East Third Street, next to the Reg Lenna Civic Center in downtown Jamestown. Bethany Bjork of Lakewood, Patricia Micciche of Jamestown, and Sara Lawrence Skillman of Dewittville will give brief talks about their work, interspersed with questions, answers, and conversation. The women’s presentations will focus on their works on display and their personal philosophies and perspectives on art. Bethany Bjork is exhibiting two pieces, a three-dimensional mixed media entitled “Puzzle” and a terracotta sculpture, “Corn Goddess.” She will talk about representing complex issues using art. Produced in oil, pastel and pencil, Patricia Micciche’s “Japanese Angel 2” was inspired by a Fulbright Fund cultural exchange trip to Japan. She is looking forward to starting a conversation about healing symbols in art. Sara Lawrence Skillman’s watercolor, “Merlin Hawk,” is an example of how, as an artist, she strives to capture the magic that is in the wilderness. She calls her artwork Natural Glimpses, and she tries to represent all the colors, contrasts, emotions and spontaneous moments woven into the web of life in her pen-ink-watercolor studies and embroidered landscapes. The third and final Salon sponsored by Creative Arts of Women, WNY Chapter, will be on Wednesday, March 21. There is no charge for the Salons, but donations are gratefully accepted. Women Create is presented in cooperation with the Arts Council for Chautauqua County. Regular hours are 10 am-4 pm, Monday-Friday until the closing reception on Saturday, March 31. For viewing by appointment, contact Len Barry at (716) 664-2465, ext. 227. Events are also planned from morning to evening on SWAN (Support Women Artists Now) Day, Saturday, March 31. For details on all these programs, visit https://womencreate.wordpress.com/.